The Thoroughbred horse Sandsablaze made history in the 1970s, achieving numerous victories with his young owner and rider, William "Buddy" Brown of New York. Despite being deemed awkward in his early years, Sandsablaze began his journey to the top of the sport with a win at the AHSA Medal Finals at Harrisburg, the pinnacle of success in the junior equitation ranks. 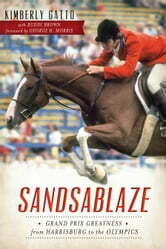 In an accomplishment that has yet to be duplicated, Sandsablaze--with Brown in the saddle--went on to win at the Grand Prix level and represented the United States at the Olympics. Some of his other key victories occurred at New York's National Horse Show and the Washington International Horse Show, as well as abroad. Nearly thirty-five years after his death, Sandsablaze remains a legend in the sport. Join equestrian author Kimberly Gatto as she tells this remarkable story of partnership and success.